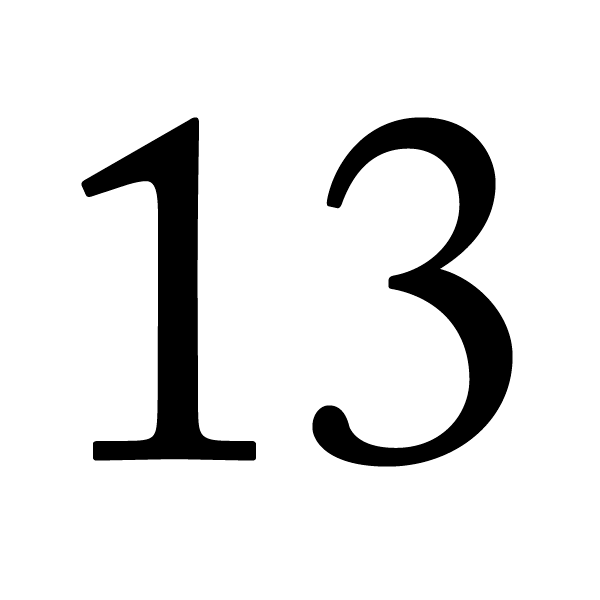 Most cultures have superstitions centered on the number 13 which can be traced right back to those ancient Greeks. They did, however, agree that fear of the number 13 is an irrational fear, calling it triskaidekaphobia [triss-ka-deck-ah-phobia]. Nonetheless the idea that the number 13 was somehow bad quickly spread, and the Greeks’ traditional rivals, the Turks, have virtually removed 13 from their vocabulary. Several tall office buildings do not have a 13th floor. Next time you’re in a tall building check whether or not your life is in danger by seeing if the elevator has a button for a 13th floor. Beware of Christening your children with 13 letter names. Some believe that people with such cursed names live notoriously bad or evil lives. Examples: Jack the Ripper, Charles Manson. Sportsmen are notoriously superstitious and many teams avoid using the number 13 in their squads or teams. I’ll admit it’s never fun being the 13th man in a sports team. One superstition is that if 13 people sit down to dinner together all of them will die within the year. One form of this legend dates back to the Norse god of mischief – Loki. The saga tells of Loki gate-crashing a party – bringing the number of guests to 13. To cut a long saga short, Balder the good was killed, and for this reason several Norwegians still believe that 13 at a dinner party is bad luck. There are 13 loaves of bread in a baker’s dozen. The extra loaf (presumably the runt of the litter) was baked as a special bribe for the devil not to spoil the batch of loaves. The number 13 plagued biblical times too. The book of Luke (chapter 22) tells us that there were 13 present at the Last Supper. There is also evidence that this Last Supper was held on a Friday, and is of course when Judas Iscariot threw a bread-loaf at Jesus. Some people (possibly Christian fanatics) are so afraid of Friday the 13th that they refuse to get out of bed or go to work on the cursed day. A study in the British Medical Journal in 1993 looked into the relationship between driving and road accidents in the UK on two separate Fridays: the 6th and the 13th. In 1998 Friday the 13th appeared three times on the calendar, in February, March and November. This is scheduled to occur again this year (2009) during the months of February, March and November. (There are usually two days of doom in a year). While occasionally we survive a year that has only one Friday the 13th, it is impossible for a year to pass without any ever occurring. So lock yourselves away, call in sick, avoid any tall buildings and dodgy people with 13 letter names, and cancel any dinner party plans in case the number 13 gets YOU! You have been warned. Do you ever use sayings such as “saved by the bell” or hear your grandmother squawk something like, “Heavens, it raining cats and dogs outside!” A lot of people still do yet have no idea where such phrases originate from. I got a little history lesson the other day which explained the dark truth behind some of these popular figures of speech. I thought I’d share them with those of you who are interested in the English language. Slip them into conversation next time you’re at the pub, or tell granny what she’s actually referring to. England back in the day was a smelly place to live. Most people only bathed once a year (usually in May). Thus most people got married in June because their BO (body odour) wasn’t too bad one month down the line. However, they were starting to smell, so brides carried a bouquet of flowers to hide any stench. 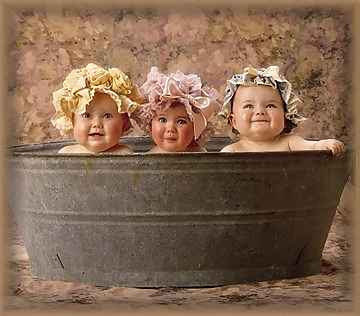 Baths consisted of a big tub filled with hot water. The man of the house had first dibs on the nice clean water, then all the other sons and men, then the women and finally the children. Last to be bathed were the babies. By then the water was so dirty you could actually lose someone in it. Women had it pretty tough in the old English days. Husbands were allowed to beat their wives by law for anything that they considered to be disobedient. The only condition was the phrase “rule of thumb” (derived from an old English law), which stated that you couldn’t beat your wife with anything thicker than your thumb. The majority of medieval Brits lived in hovels that had thatched roofs with no wood underneath. It was the only place for animals to get warm, so all the cats and other small animals (mice, bugs) lived in the roof. When it rained it became slippery and sometimes the animals would slip off the roof. There was nothing to stop things from falling into the house. Besides having bugs, animal droppings and other crap fall from the roof the floors were dirt. Only the wealthy had something other than dirt such as thresh (straw) which was kept in place using wooden planks (hence the saying “threshold”). But for the poor it was plain dirt. Those with a little money had plates made of pewter. Food with a high acid content caused some of the lead to leach into the food, causing lead poisoning and often death. This happened most often with tomatoes, so for the next 400 years or so, tomatoes were considered poisonous. Lead cups were used to drink ale or whisky. The combination would sometimes knock the imbibers right out for a couple of days. Someone walking along the road would take them for dead and prepare them for burial. They were laid out on the kitchen table for a couple of days and the family would gather around and eat and drink, or chew the fat, and wait and see if the poor sod would wake up. England is small – very small relative to the huge population at the time. But the death toll was high and gravediggers started running out of places to bury people. So they would dig up old coffins, take the bones to a “bone-house”, and reuse the graves. When reopening these coffins, 1 out of 25 were found to have scratch marks on the inside, meaning 1 in 25 people had been buried alive. To prevent this from happening they would tie a string on the wrist of the corpse, lead it through the coffin and up through the ground, and tie it to a bell. Someone would have to sit out in the graveyard all night (the “graveyard shift”) to listen for the bell. If you know the origin of any other sayings please share them below and help spread a little knowledge!